where your customers already love to shop. friendly enrollment interfaces, and top-tier admin tools. BookThatApp all but drives them there. you rent items by the hour or day. BookThatApp works within Shopify to track your reservations natively. A booking appears automatically when an order is placed. BookThatApp connects directly to your product and cart pages, so it offers availability updates to customers in real time. BookThatApp can create reservations when payment is authorized, but not yet captured. The booking gets confirmed automatically once you receive payment. View your schedule by Day, Week, or Month. See your confirmed and pending reservations at a glance with built-in color coding. BookThatApp is the perfect reservation engine for rentals, classes, events, and appointments. 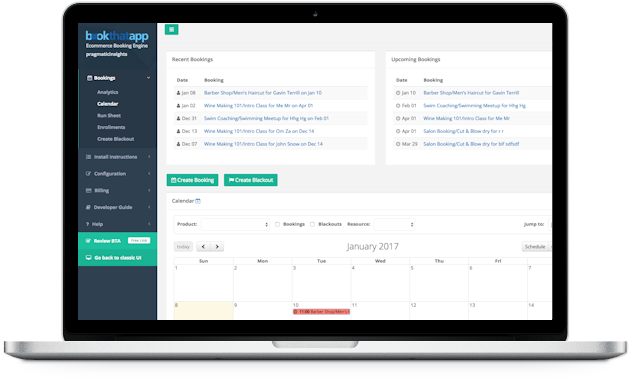 BookThatApp lets your customers reserve time on your business’s calendar, right on your Shopify site. Now you can offer appointments, classes, rentals, tickets, and more all in one place. Customers stay in your shop, and your third-party hassles are over. With BookThatApp, customers can browse your course calendar or shop for courses by name, date, time, and more. You can create new courses, assign instructors, and set class capacity; and you can change them at any time. Plus, built-in reports power outreach and student admissions. BookThatApp lets your Shopify customers search or browse your event calendar right in your shop, and they’ll get a professional, customized eticket for your tour, show, or group activity. Easily sell different tickets for children, adults, and seniors, and your eticket never gets lost. BookThatApp can automatically re-send etickets with any event reminder. With BookThatApp, your customers can search and browse your products with the Shopify experience they love. While you can rent your products over any date/time range to give your business the flexibility it needs. Plus, BookThatApp can remind your customers when items are coming due, so your stock stays available for new renters. Now you can create appointment slots for your providers in Shopify, and you can quickly map providers to their right services. That means customers can shop for appointments by service provider, date, appointment type, and more. Even better, BookThatApp also prevents scheduling conflicts for providers who perform many different services. "We are using the BookThatApp with great success. We are new at Shopify so we got the team at BookThatApp to help us get it all set up. It was a great time saver. They have been very responsive to our needs. Very happy and we would highly recommend you give them a go." Industry-leading reservation management technology, built especially for Shopify. Unlike 3rd-party reservation services, BookThatApp installs directly in your Shopify store. That means when a customer places an order, BookThatApp creates the appropriate booking automatically. BookThatApp keeps track of bookings in-house for you, so you can stop managing 3rd-party reservations and redirecting customers out of your store. Shoppers want up-to-the-second availability information. No one likes to discover mid-check-out that the last seat or the perfect time-slot’s already long gone. Because BookThatApp is Shopify-integrated, it communicates directly with your shop’s product and cart pages. So when booking availability changes (including new openings due to cancellations), BookThatApp updates your inventory immediately. Your customers shop on the go, so your storefront must be ready to sell on any device. BookThatApp’s user interface was designed to intelligently adapt to different screen sizes and resolutions, so your customers can easily find what they’re looking for no matter how they shop. BookThatApp understands not every reservation needs to be paid for immediately. If you choose to offer this option, BookThatApp can create “pending” bookings for customers who have authorized but not yet completed payment. Best of all, BookThatApp automatically marks a booking “confirmed” once payment is captured, so there’s no extra work for you. Your business stays agile by adapting to your customers’ evolving needs. Perhaps you want to offer both classes and rentals, or both event tickets and one-on-one appointments? BookThatApp is the only booking engine that unlocks your power to do more, because only BookThatApp supports multiple booking types at once. 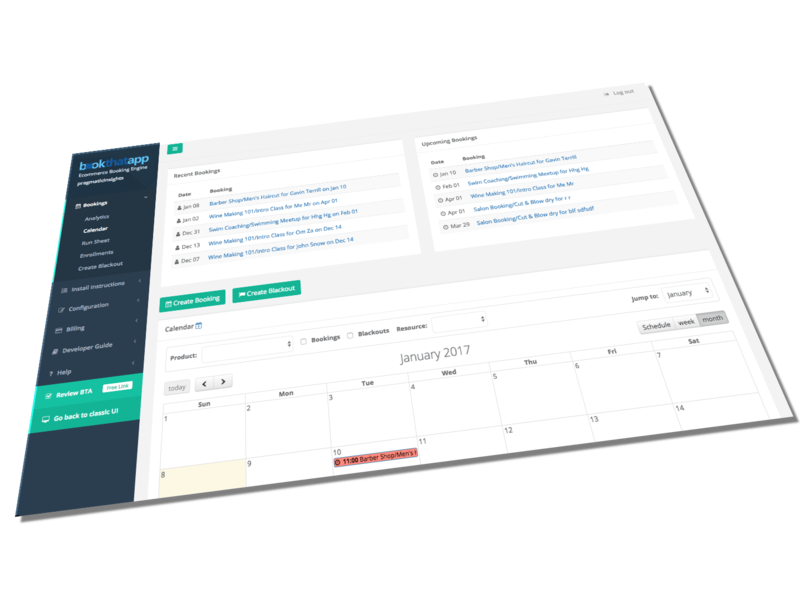 Plus, you can choose from a suite of calendar themes and event color-codings for intuitive customer navigation. With BookThatApp, you have total control over your booking periods. You can decide the days and times when you’ll accept new reservations with “Opening Hours,” and you can completely restrict specific days (such as public holidays) with “Blackout” settings. You can even specify “Lead Time” and “Lag Time” for rental periods to allow time for shipping items both ways. BookThatApp’s built-in calendar lets you review your bookings in familiar Daily, Weekly, and Monthly formats, so both short- and long-range planning are a snap. Plus each booking gets color-coded, so you can immediately distinguish between “confirmed” and “pending” reservations. Your storefront retains its look and feel with BookThatApp, because BookThatApp supports all of Shopify’s free and paid store themes. From the newest, trending themes to tried-and-true grid or industry-specific layouts, BookThatApp plays nice with them all. BookThatApp is built and lovingly maintained by Zetya, the Shopify experts. For fast, expert help with BookThatApp, please visit our always-open help desk and dedicated support forum. If you’d rather speak directly to a person, we’d love to hear from you! We always appreciate learning your ideas, questions, and challenges. Our customers make BookThatApp Shopify’s top booking engine. Or send us a tweet and make our day.